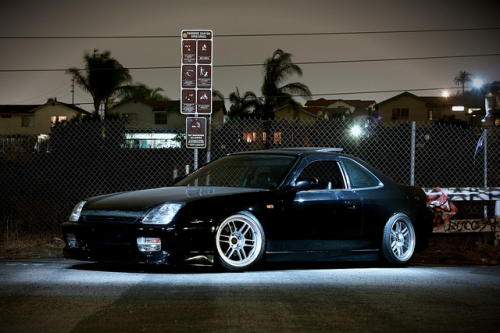 Hi im looking at buying a 17x8 Rota Grid with offset of 30p for my 5th gen Prelude and after a flush look. It's pretty low which means there's no gap between the guard and the tyres (215/40/17 all round). -will the 17x8 30p offset be all good? -any pics of a 5th gen lude that has got a 17x8 30p offset wheels around there? -is that set up too ambitious or just right to avoid a hella fail look? you'll be extending the wheels nearly 2" (44mm) from stock! whether they fit will depend on your drop, camber, and tires (size and profile/curvature) i suppose. i'm dropped 1.3/1.5" and have oem tire sizes and rims. at most, i've eyeballed about 20-25mm play. that is, without angling the hell out of the rims and stretching the bejeebus outta some tires. Last edited by legally_lewd; 12-30-2011 at 01:15 AM. sweet. I'm currently running on 17x7.5 ce28n's with 33p offset if that helps. i might post up a pic of what my wheel fitment looks like atm. ok, so from where you're at now, you'll be extending the rim about 9mm. just take a ruler and place it against your upper sidewall. the space between that and your inner fender is how much room you have. if it's >9mm you're golden. Last edited by legally_lewd; 12-30-2011 at 02:21 AM. last 2 photos are koya drift teks 17x8 34p offset. oh wow. from the pics, it looks like you can do it! So you think a 17x8 30p offset will give me enough stance with the wheels being Rota Grids that has the concave shape? *is 30p offset just right or lower offset like 25-28p? The lower the offset, the more concave. 17x8 +25 may require a slight fender roll depending on how aggressive/flush you want the fitment. well, 'low offset' is really a relative term. my previous car was a 350z. some folks did zero offsets and the truly insane ones even did negative offsets. all this on 10-12" wide rims! my old 350z had 19x 9.5" (f) and 10.5" (r) rims with +17 offsets. and i still had plenty of room because i did not roll my fenders. the prelude is totally different. most hondas don't have much of a wheel well. that is, it's not very deep. an offset number is really just the mm from the center line of the rim. so an 8" rim's center would be at 4". the offset, then, is where the face sits relative to that center line. some kids that don't know what they're talking about are easily impressed with a 'low number' as the offset. don't let this fool you. what really matters is how you want the rim to sit in the wheel well. personally, i like a FLUSHED look. that said, some cats take this WAY TOO FAR and go beyond flush! they'll make the rim stick out PAST the fender. which looks rather retarded in my opinion. however, most will praise this because it is considered 'ballsy' or aggressive. what they are not realizing, i think, is that these types of 'hella flush' offsets only ruins the car! the closer the rim gets to the fender, the more camber you need to have to fit the top of the tire under the wheel well. so, most rims that are truly flushed with the fender will have about 6" of rim angled out past the fender. others will even make the top of the rim stick out past the fender with the tire stretched all out. by definition, this is no longer flush. in the early '90s we used to make fun of nissan sentras that did this with little, spoked rims. with my own car, i would like the rim and side walls to be as close to the fender as possible without taking away from the wheel's ability to travel throughout the suspension safely. i'm not even going to go into the 'stretched tire' look. so, is plus 30 a low offset on a 8" wide rim? for a honda prelude, yes. i would say that is a 'low offset'. for a mazda miata, i'd say those would be insane offsets. however, for a 240sx or 350z? not so much. like i said, i'm new to the prelude and am not really sure what folks are running. the best thing to do is to ask around what others are running and see how far you want to go from there. Last edited by legally_lewd; 12-30-2011 at 03:03 AM. Not only a fender roll will be required, you'll need about 10mm spacers. Have you checked the back spacing at the caliper and the hub. 17X8 rims are Full size car size. Also, your tires will need to be changed. If you have 215 Diameter now, You're gonna need 225 35 17 diameter, adding a lot of money to the swap. IF IT ALL FITS. "215" isn't the tire's diameter. it's the width of the tire tread. ^^ Shot! Same thoughts that's been running in my mind. i know hondas are no sylvia's or any nissans out there when it comes to wheel widths. good point on safety aswell as this is my daily driver. yeah man. a flushed wheel looks great on a show car. but it's a nightmare as a dd. your sidewalls are all compromised and your suspension travel is severely limited. as for me, i'd rather be able to corner and go fast(er) before i just sat and looked pretty. my two cents. in the end, the decisions is yours. you could probably make it fit! but you'll also be losing more than you gain. let us know which way you go. 10mm spacers for what? breaks are all sweet. 215/40's are almost perfect with this kind of set up as oppose to 205/40's but still depends on how low the car is. all im concern right now is about the proper stance that i can achieve with the dimensions that ive given. as you can see i tried 17x8 34p at the photos i posted. I'm sure he just mistyped. He knows his stuff. Well my post comes from 2:00am, so I'm not really going spelling/grammar nazi right now. Also the spacers are for the shock rub when you go to 225 / 35 / 17. you're maxed out now at 17x7.5. the wider tire is gonna rub against the shocks. get a used 225/35/17 tire, mount it and see for yourself. you also got to take into account shock travel after this wheel is installed. It's just my opinion, do what works for you. Last edited by Sideswipe SI; 12-30-2011 at 03:39 AM. Well my post comes from 2:00am, so I'm not really going spelling/grammar nazi right now. Also the spacers are for the shock rub when you go to 225 / 35 / 17. you're maxed out now at 17x7.5. the wider tire is gonna rub against the shocks. get a used 225/35/17 tire, mount it and see for yourself. you also got to take into account travel after this wheel is installed. If you can pull it off, Cheers to you. well, if its a matter of money, of course you should go with what you can afford. if its a matter of 'gotta have its' then, i would wait and get a custom wheel! i wasn't trying to blast on you. and i'm not trying to be condescending. as the new guy to this forum, i'm not sure who knows what so i'm just not making any assumptions, you know what i mean? again, if it came off as blasting you, i apologize. just not sure if you knew what those numbers mean. you'll be surprised at how many don't. thanks mate. just talked to my mechanic which is the same guy sussn' out the wheels for me. we're gonna try to play with some different fitments next week. this is to avoid the risk of ordering a custom one that might not up to standards im afraid. will keep you guys updated. last resort will be the koya drift teks 17x8 34p which aren't that bad i reckon. There's a dude who fit 17x10 +18 Enkei RPF1 wheels with 235/40/17 tires. What he's doing is certainly possible. I hope to one day run 17x9.5 +18 Enkei RPF1 wheels with 245/40/17 tires. Nice 'n meaty. Last edited by Vanz__; 12-30-2011 at 12:35 PM. As for tires I think this might help you. It's not for hellaflush fitments, but nevertheless. Yeah OP, 215/40/17 will be pretty stretched on an 8" width tire. It's totally up to your tastes, but I personally like meaty tires on my wide wheels. This way, going over a pothole won't **** your wheels up. Jaysus kripes! 17x9.5? Who needs brakes? The tire rub will be enough!LOL! not saying it can't be done, obviously, but that takes work. Damn vanz. Contact patch of a F1? Check. No hellaflush or any of that ****. I just want contact! Yeah I plan on getting NSX calipers with slotted rotors, so I hope fitment will be alright. It's not like the Endless / Spoon big brake kit. Plus, I've always wanted beefy tires and wheels since I started trolling the S2000 forums a few years back. Those guys do fitment right. cheers for all the info guys. 17x9.5 will be too wide for me i guess. 8'' should be enough and tyres like 215/40/17 with a bit of stretch should look a bit tight. i will just play on offsets going from 35p and lower. will keep you updated guys. 17x8 will fit just fine, and you can run a 205 or 215 tires just fine as well. I have a set of Rotas 17x8+48 offset and they fit just fine and they currently have some 215/40 tires on them. Last edited by Prelude1897; 12-30-2011 at 08:17 PM.